The Cheviot originated in the Cheviot Hills, on the border of England and Scotland. Recognized as a hardy sheep as early as 1372, Cheviots did well in those bleak, windswept conditions, with their strong constitution, easy lambing, well developed mothering instinct, and fast maturity. Introduced to Australia in 1938, the Cheviot has proved its ability to withstand the cold, wet winters of Southern Australia, and its vigor in foraging through the hot, dry summers, when feed is scarce. The breed was introduced into the United States in 1838 from their native Scotland. The Cheviot is a distinctive white-faced sheep, with wool-free head and legs, pricked ears, black muzzle and black feet. It is a very alert, active sheep, with a stylish, lively carriage. 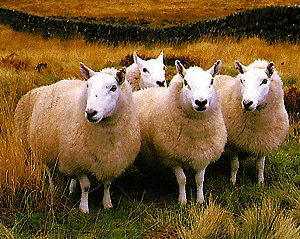 The Cheviot is a long-wool breed, hornless and of reasonable frame. Initially, it developed some popularity in Australia as a sire of top quality prime lambs as well as for crossing with Merinos to produce prime lamb mothers. Cheviot wool has a distinctive helical crimp, which gives it that highly desirable resilience. Cheviot wool is often blended into other yarns to give resilience and durability to the finished article. The fleece is dense and long-stapled, of 56s-50s quality, and springy to the touch. These special properties also help reduce fleece rot and fly strike problems. Bred to look after themselves, Cheviots need less husbandry. Their ease of lambing and strong mothering instinct means fewer lambing problems. Hard black feet make them less prone to foot rot. Their tendency for worm resistance means less drenching, less crutching and less fly strike. With wool-free faces, Cheviots never suffer from wool blindness. Mature body weight for the rams is 160 to 200 pounds (72-90 kg) with the ewes weighing slightly less at 120 to 160 pounds (55-72 kg). Mature ewes will average a five to ten pound (2.25-4.5 kg) fleece that has a micron measurement of 27.0 - 33.0 and a spinning count of 48-56. The staple length of the fleece will be three to five inches (7.5-12 cm) with a yield of 50 to 75 percent. British Sheep Breeds (poster), British Wool Marketing Board, Oak Mills, Station Rd., Clayton, Bradford.